SafetyDriversEd.com collects personal information when you register. We ask for your legal name, birth date, mailing address, phone number and email address. SafetyDriversEd.com keeps records of the date and time you complete each section of the course. We also keep records of your test scores and course completion date. SafetyDriversEd.com accepts credit card payments (via PayPal), personal checks and money orders. SafetyDriversEd.com uses information for the following general purposes: to customize your driver's education certificate of completion, to fulfill your requests for online driver's education course, contact you, confirm with Department of Motor Vehicles (DMV) that you have completed the online course. SafetyDriversEd.com was created and written for Provisional driver (persons under 18 years old). This program fulfills the teen driver's education requirement for the Sate of California. Minors are required to have their parent or guardian's permission prior to registering. SafetyDriversEd.com will not solicit any non-driving related offers to customers. SafetyDriversEd.com understands that your privacy is important. SafetyDriversEd.com does not sell, or share personal information about you with other people or nonaffiliated companies except to provide information to DMV, upon request. For example, DMV may contacts us to verify that you have successfully completed this course. Your first 25% of the course is absolutely free. If you choose not to continue with the course, you are free to do so. 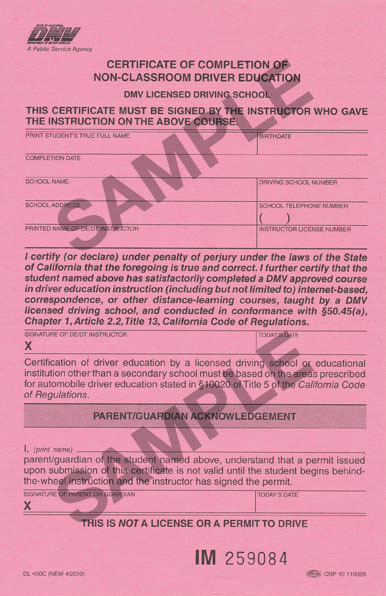 We reserve the right to send you certain communications relating to SafetyDriversEd.com services, such as announcements, informative bulletins relating to driving, insurance or new CA laws, course evaluation, or other driving related messages. Parents will receive an informative newsletter regarding CA teen licensing procedures and teen laws along with certificate of completion. SafetyDriversEd.com may update this policy.